Eighteen days on the road, twelve nights spent outside in five different states, and over three thousand six hundred and fifty three miles driven. This was our longest on-continent road trip to date and in a way, a test run for longer ones yet to come. At the beginning we wondered if camping for longer than a week and a half was something that would actually jive for us. Would we want to stay out longer? Just how long could we live out of the @xoverterra? On the seventeenth day of our trip we were about an hour and half away from home. It was early evening, two days without showers, and we stopped to camp at one of our favorite sites in the eastern cascades. Our shower that evening was in a rushing cold river just as the sun dipped behind the treeline. With no extra firewood in the car, we scrounged moss, twigs, and Zeke went full woodsman and chopped a couple of logs off a fallen tree. This was maybe my favorite night of the whole trip. Yes, we did want to stay out longer. While our time in Oregon was short, we finally checked off two of my, for lack of a better term, bucket list items: camping at East Lake in the Newberry National Volcanic Monument and making it to the top of Paulina Peak. Both were everything I had hoped for! The views from Paulina Peak, an easy drive up a well graded single lane road, were outstanding. Such great perspective that yes in fact, when you are kayaking around Paulina Lake, hiking on the lava fields, and sleeping by the shores of East Lake - you're inside a volcanic caldera! It's crazy and absolutely mind blowing and of course, taking a dip in the beautiful waters of East Lake is now one of my favorite memories for that exact reason. Camping Pro-tip: Reserve one of the water/beach side sites at East Lake. Thanks to my father-in-law we scored a site just across the road with view of the lake, but I definitely made plans in my head to come back to a reserved beach front site. Nothing like lounging in a chair in your campsite, looking at a beautiful lake, all the while being inside a caldera. After I spent a week and half based out of Boise in early June, including a long day trip up through the Sawtooth Mountains, Idaho featured prominently on our itinerary options for this mid summer road trip. From Central Oregon, we booked it fast for the long drive day towards Redfish Lake - just outside of Stanley, ID (which keeps getting mentioned around the interwebs as a hidden gem or something like that). The many campgrounds around the lake (Sockeye is THE BEST - yes, we drove through almost all of them) fill up fast as first-come first-serve - even mid week. Those that don't seem to fill have a bit of a red ant problem (I'm looking at you Mount Heyburn). After some hesitation about a late night start to a dispersed camping option, we happened upon a beautiful site just about ten minutes from the lake at Sunny Gulch Campground. We loved it so much, it was the only campground we spent more than one night in for the entire trip! Getting out on the water was one of my only goals for the entire trip and open top kayaking on the lake filled that need perfectly. If you're like me and once you complete one goal, you immediately go about setting another - it became imperative to not just get out on the water, but to kayak far enough around two plus bends in the lake to soak up the views of the Sawtooth's you won't otherwise see. Mission accomplished and best lunch spot of the entire trip found here. 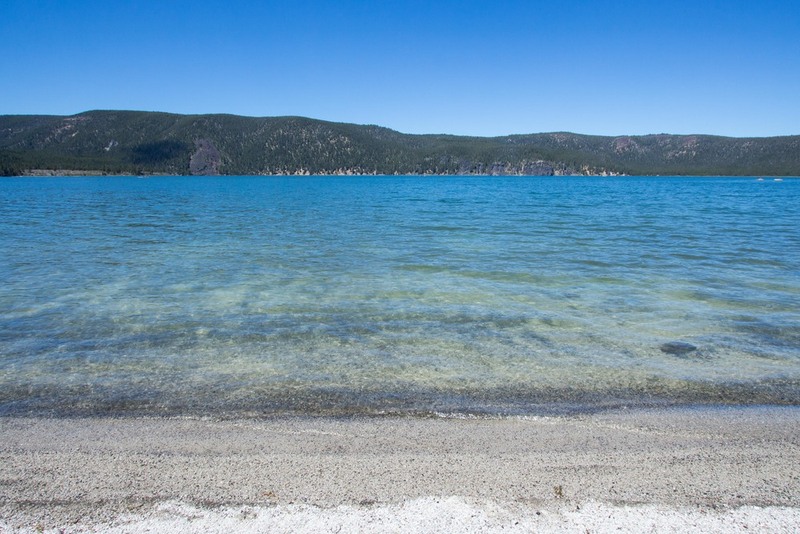 Also if you're wondering, the temperature in Redfish lake on an 80 degree day is just about perfection. It is chilly, but it's not anywhere near as cold as some of the glacial lakes in Washington State I've plunged in. Continuing the journey east, we drove out of the Sawtooth's towards Sun Valley and prepped for another long drive day by picking up snacks in town (including gluten free stroopwaffels - not all that tasty or exciting as it turns out). We planned our route towards Wyoming to cut just over the northern edge of Craters of the Moon National Monument & Preserve. That drive, through less than exciting territory - totally worth it. It's an excellent break, even in triple digit heat, to drive the loop road through a small portion of the monument in your air conditioned car. It's a mentally jarring experience if you've never thought much about Idaho's volcanic history - seeing the many cinder cones in the distance and the black fields volcanic rock at your feet. If you're traveling with any heat sensitive creatures note that we kept our pup in the car the whole way after the bottoms of my shoes melted a touch after jaunting down the road to take a few pictures. One last note before a bit of time travel, if you're headed out of Idaho Falls towards Wyoming - Palisades Reservoir makes an excellent snack/lunch/dinner stop. There even seem to be a few ways to get capable vehicles down on the shore for a tailgate meal. Idaho was the only state (other than our home state of course) we left and traveled back through on our three day journey home. Part of this was a matter of simply taking the most direct route and the other was a small hope I was harboring to visit the City of Rocks Natural Reserve. I'd seen the intriguing pictures on a couple of Idaho focused Instagram accounts but the area is so remote, along the Utah border, if we found ourselves relatively close it seemed like a good spot to spend the night. With questionable directions, we drove for awhile on dirt roads to reach the reserve. Hands down, our favorite campsite of the entire trip. It couldn't have been more perfect - picturesque, quiet (minus the howling wind in the middle of the night), chill neighbors, and plenty of reasons to return in the future. Climber or not, this is maybe one of the places I'd recommend the most in Idaho. A casual mention followed by a quick Google search is what drew us to add Wyoming's Wind River Range to our itinerary. I'd call it the most pleasant surprise of our entire trip and the state I most hope to return to as soon possible. The small southwest corner of Wyoming we explored was filled with some of the most lovely dirt roads and mountain peaks I've seen - all with just the right amount of company to know you'll have help if something happens, but not enough to feel like you're in a wilderness theme park. We used Pinedale as a pseudo base camp to plan our stay - thankful for the wifi at the Visitor's Center and the excellent cappuccinos at the Heart & Soul Cafe just two doors down. By the time we had arrived in Wyoming, the weather had caught up with us. Our first night was spent at Kozy Campground, just across the border, with thunder and lightening in the distance and we weren't too keen on repeating that experiment in an elevated roof top tent. On a whim, we looked up and found some very reasonable mid week rates at the Halfmoon Lake Lodge, and took our chances on a drive out along the first of many dirt roads. Arriving in the early afternoon the office was closed but as we were stretching our legs and admiring the views from the lodge patio - Parsley made a quick friend. It turned out to be the chef, who gathered a few other restaurant staff to help us get checked in to an open cabin. I can't say enough about how accommodating the folks at the lodge were - definitely a spot worth returning to. After refreshing night inside, we set out to drive the Green River Lakes Byway to get another view of the Wind River Range and ended up crossing the continental divide over Union Pass to an entirely different side of Wyoming filled with red rocks and cliffs. Compared to some of the dirt roads we traveled in Colorado, these were for the most part very well graded without any hair raising drops. Combined with not much traffic, plenty of beautiful places to stop, and it was maybe one of my favorite drive days of the trip. Thanks to a recommendation from a Wyoming native, we spent the night inside beautiful Sinks Canyon State Park - worth further exploring if you have the time. The non-roof top tent friendly weather, (read: lightening) followed us from Wyoming. We arrived just in time for the 4th of July holiday weekend. Heading into Colorado, the land of what we had been lead to believe by the internet was simply lousy with dispersed camping opportunities, we found ourselves unable to find a single open spot in any campground for miles around and zero access to the wilderness area that surrounded us. Fortunately, the good folks at the Hotel Denver (not actually located in Denver - just to clarify) found us one extra room and even gave us a little discount after hearing our sob story. The next night we made tracks for the San Juan Mountains, again figuring that finding a campsite would be no big deal. After spending half a day driving the Million Dollar Highway looking for anywhere to legally park and camp, we eventually found an open area on the way out of Silverton, south towards Durango. It was busy and the road in very rough, but nonetheless it was a legal spot to camp. Many firecrackers, dirt bike jumping hooligans, and all night generators later - we skedaddled first thing in the morning to the Silverton visitor center's parking lot for breakfast. I've never had such a poor experience with other campers as we did here and oh how it made me thankful for all the rules of formal campgrounds and enforcing campground hosts home I normally chafe against. Tackling the Alpine Loop Back Country Byway was our first objective. Initially we had thought about driving it over two days and camping near Animas Forks but again it was busy and the neighbors not very friendly. In terms of conditions, the drive into Animas Forks was reasonably smooth and not at all harrowing compared to what was yet to come. Along the way, you drive by old mining operations and a reasonably nice alpine meadow - all of it was honestly a bit meh for me. If you continue on past Animas Forks to California Pass, that's where the scenery really begins to impress. In early August, there was still feet of snow on the ground as you slowly make your way up and the views continue to astound. As we trekked on from the pass, my nerves with the sheer cliffs and altitude started getting to the best of me, cresting just before heading down Corkscrew Pass, I actually felt my legs start to give out (that's me laughing about it and quickly getting back to the car here). The subsequent very slow journey down the rocky slops of the aptly named route were the most terrifying I've ever spent in a vehicle minus the time a fully loaded F250 blew a tire right in front of me on the freeway at full speed. In retrospect, it was entirely worth the fear and terror for the amazing experience and stories. Exhausted and ready to calm our nerves, we headed south to Telluride early, landing the last spot at the Matterhorn Campground on the 4th of July - again thanks to a wonderful host who maybe took a little pity on us and gave us an RV spot. In a second day of camping luck, we drove into Telluride early the next day and snagged a riverside spot at the Town Park Campground. Unlike most in-town campgrounds, it's not just a big RV parking lot - there are large secluded spots, river access, trails, showers, and it's super easy to take a stroll into downtown to grab takeout for dinner. We spent the next few days resting, doing laundry, and enjoying some out of the car time walking and hiking around Telluride. A couple of my favorite parts of Telluride were daily cappuccinos at Cowboy Coffee, browsing for books at Between the Covers, riding the free gondola to Mountain Village, and getting the pup some good playtime down at the river. We did attempt and sort of complete one hike up to Bear Creek Falls, recommended for those still getting used to the altitude. My sea-level dweller lungs just never seemed to adjust and I was sluggish the whole way. Later I'd research this a bit more and learn it can take up to six weeks to adjust - oh well. Still on the take it easy wagon and considering we had a wedding to attend the following day, we used the Hotel Tonight app to book a room at a Kimpton in nearby Aspen. As it turned out, we'd lucked out and booked a suite and spent another enjoyable day checking out another Colorado mountain town we'd heard so much about in ski movies all these years. My favorite parts? I loved hiking and dipping my feet in the water at the Grottos, just about 15 minutes outside the city, eating all the goat cheese from Avalanche Cheese Company, and browsing in Explore Booksellers. After logging as many miles as we could for the first two of the three day trek home, we found ourselves within an hour and half of Seattle, about to pass the exit for one of our favorite areas to camp in Washington State - the Tearaways. It was a Monday night, so we'd likely have our pick of campsites and headed towards Red Mountain Campground. This evening turned out to be maybe my favorite night of camping ever. It started with pulling into our favorite spot, getting a fire rolling with materials we'd foraged from the area, and jumping into the rushing river after two days without a shower. We ate our favorite camping meal of the trip, fresh pasta with basil, grated pecorino, sautéed cherry tomatoes, and basil and relished the quite time spent outside. The next morning, following another dip in the river, we drove into Roslyn for cappuccinos and more book browsing at Base Camp Books & Bites. Perfect way to end a trip.